When designer Andrea Van Soest of Vantage Design Studio and her husband purchased their Palm Springs home, a total makeover was inevitable. Originally built in the 1950s, the mid-century ranch was in dire need of a renovation. The duo found themselves to be in good company—the majority of homes in their neighborhood were untouched and undergoing a similar revival, thanks to a fresh crop of families moving in. “We had to rip it out and start over yet keep that mid-century charm,” recalls Van Soest of the home project. They did just that by marrying the iconic style of retro Palm Springs with hints of Scandinavian design. Van Soest’s inclination toward a Scandi-inspired look was born out of her wish to incorporate a pared-down scheme that would result in a relatively more modernized design. Van Soest began by installing terrazzo floors throughout the space to add a hint of pattern and complement the neutral palette. While the majority of the home features shades of off-white, cream, and gray, saturated splashes of color (like a lively green potted plant in the bedroom room) also make an appearance. In the dining room, a pair of vibrant coral chairs wink at a similar hue in the adjacent kitchen, merging the two spaces together. To usher the space into the 21st century, Van Soest brought in modern, light wood cabinetry with clean lines and installed vertical gray planks to give a sense of higher ceilings. She chose a “jewel-like” backsplash to add a bit of luster to the mix. Keeping in line with the established aesthetic, her approach to the living room’s design was all about striking the right balance. “Sticking to the Scandinavian-inspired scheme became challenging in that I had to avoid using loud colors and making sure it all flowed,” she explains. Her trick? Integrating an abundant array of textured pieces—the flat-weave rug, side chairs, throws and linen pillows in varying neutral shades—to create a warm and layered look in the near-whitewashed space without the need for additional color. On the wall above the sofa, Van Soest purchased digital downloads from Etsy—(high-resolution photography, which can be purchased, downloaded, and printed out at home)—and had them framed. “It’s a great way to get large affordable art,” she adds. The powder room was another opportunity for Van Soest to make a bold statement in a smaller space. A geometrically patterned tile sets the backdrop against hexagonal floor tiles for a high-contrast modern finish. Not to be forgotten, the front door also underwent a little zhuzhing. 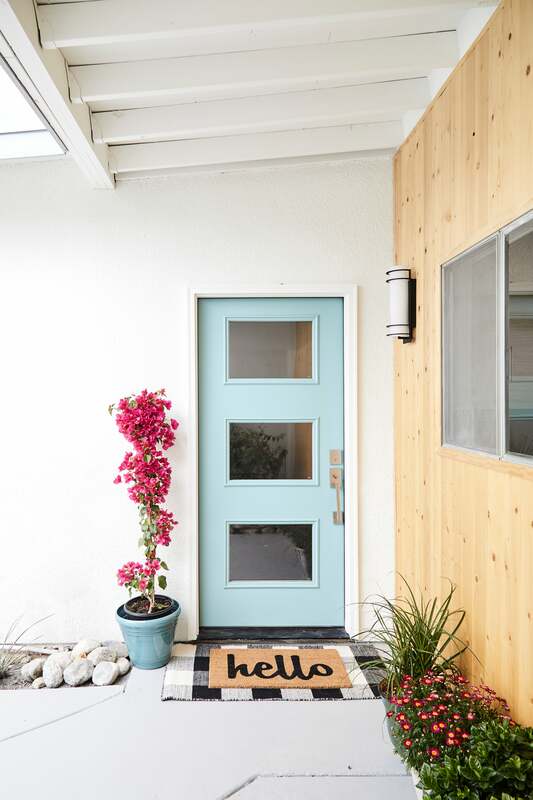 “There are so many fun pops of color around Palm Springs, and we wanted to emulate that,” the designer says of the bright blue paint that decks the entry, which is also a subtle nod to the backyard pool.